Designed to run sequentially, OSCO made Valve Gating simple and reliable. 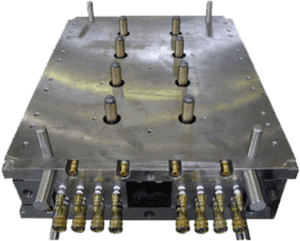 Osco’s systems are designed with the designer, mold maker, and molder in mind. Osco’s Valve Gate Nozzle (VGN) was engineered to leave the best possible gate cosmetic on the molded on the part. Self contained free-floating hydraulic cylinder. Available in either hydraulic or pneumatic. Simplified machining, installation, and operation. Pin guides to eliminate gate wear. Gate sizes up to 1/2″ diameter.